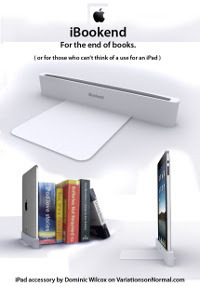 The iPad isn’t even out for a week yet and folks have already found a new use for it – to function as a bookend. Case in point, the iBookend that will transform your iPad into an everyday object, although we are rather wary of the iPad being slim and slender, some accidental pressure or knock might just cause the display of the iPad to crack, no? At least you can watch your movies on this without having to worry about tired hands holding the iPad for a couple of hours.